Google has big plans to change and further improve the search experience over the next 20 years. If you want to continue to be found by your target audience in 2019 and beyond, you’ll need to think more fully about what they need and improve your SEO accordingly. This article takes a look at how Google is changing the search experience and what you need to do. On 27th September 2018, Google celebrated its 20th birthday and, with it, two decades of helping people to search the internet. To mark this anniversary, Google’s vice-president of search, Ben Gomes, published an article about the company’s plans for improving search for the next 20 years. I wanted to have a look at the biggest takeaways from this and give you some practical recommendations to improve your SEO so you stay ahead of the search game. Before I do that, I thought it would be helpful to look at Google’s first 20 years and how its core mission has influenced the development of search during that time. Ben Gomes explains that, from the outset, Google’s mission was to “organise the world’s information and make it universally accessible and useful”. In 1998, the web consisted of 25 million pages (the equivalent of a small library). Although the web has grown exponentially to contain hundreds of billions of pages – i.e. more information than could be physically held in all the libraries of the world -, Google’s core mission remains the same as on the day the search engine launched. The focus of search must always be on the user and meeting their needs. The ranked pages must be useful, high quality and relevant. 15% of the queries Google receives on a daily basis have never been seen before. An algorithmic approach is the only way to address these queries and to build context and understanding of the search intent. Every change to the algorithm must be rigorously tested before the changes are rolled out. These principles have held true since 1998 and I’m sure they will still be evident in 2038. Google wants search results to reflect that people have different knowledge levels about a topic and, even though they may not know what they need to search for in order to develop their understanding, the search engine will be able to step in and guide them. To achieve this, three fundamental shifts will be happening. Want to know more about these shifts and what you NEED to do to improve your SEO in 2019 and beyond? 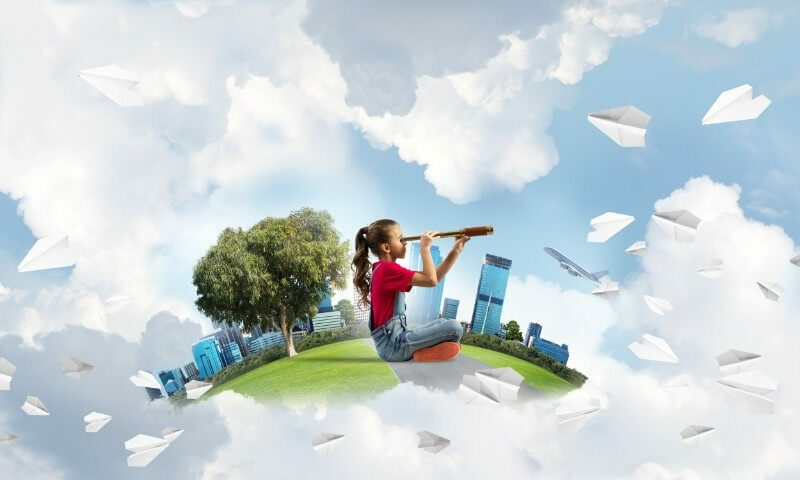 The folks at Google feel that search is less about a process in which we ask a question and get a definitive answer than a journey that encompasses lots of questions, diversions, changes in direction and new perspectives as our knowledge deepens. Once you’ve started engaging with a topic, you’ll probably search wider as well as deeper around the pillar topic (the overarching subject) and all of its associated clusters (related sub-topics). Search engine optimisation is a perfect example. If you were new to the topic, you might ask ‘What is search engine optimisation?’ or start searching for information about what keywords are and how you should use them. Very quickly though, this could lead into researching voice searches, pillar topics and clusters, meta data, on-page SEO, technical SEO, off-page SEO, writing for the web, EAT (Expertise, Authority and Trustworthiness), and much more. Google searches should increasingly reflect not only the tangents and deeper levels our search queries can take us to but will also begin to anticipate where our search journey might lead us next, e.g. if you read about dog breeds, your next step might be to search about caring for a dog, training tips or how to choose the right puppy. Google’s search suggestions will reflect this. Another example given by Ben Gomes is how the information we search for changes according to our circumstances. For example, when we start planning a holiday our initial searches might be for suitable destinations but, once the destination has been decided, we might then search for hotels, places to eat and drink, entertainment or local guides to the area. Searches are likely to be different before our holiday and while we’re actually there. Google also wants to make it easier for us to pick up tasks where we last left them. There are increasingly more ways to keep track of ideas, follow and retrace different search routes and collate the content you’ve found useful. With this in mind, Google has rolled out Google Discover, which is a more accessible way to access your search history as well as to discover new content when searching on mobile devices. 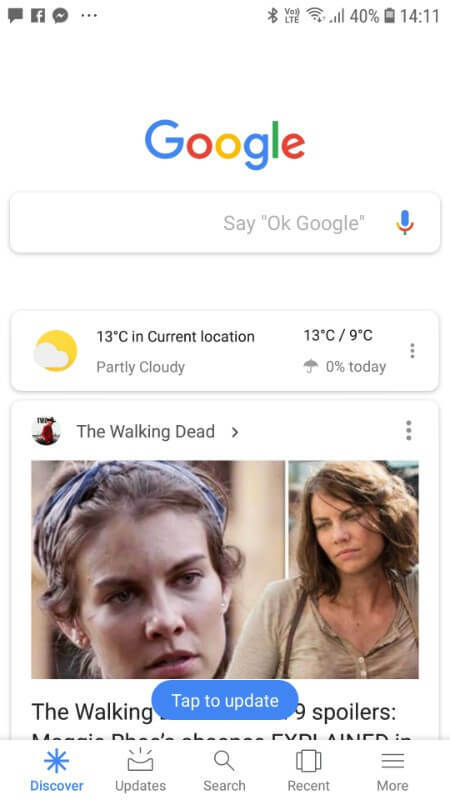 You can now see your personalised Discover ‘Activity Card’ in the Android and iOS Google app but Google Discover will also soon be rolling out to the Google.com home page on all mobile browsers. Open the app to make a search and you’ll not only see the search bar but also a series of topic panels under the main ‘Discover’ tab. As you can see from the screenshot below, these panels might relate to TV programmes you’ve shown an interest in, current news stories and older articles related to your interests, topics currently trending on social media, highly cited content and more. You just need to scroll down the feed to explore the suggested content. 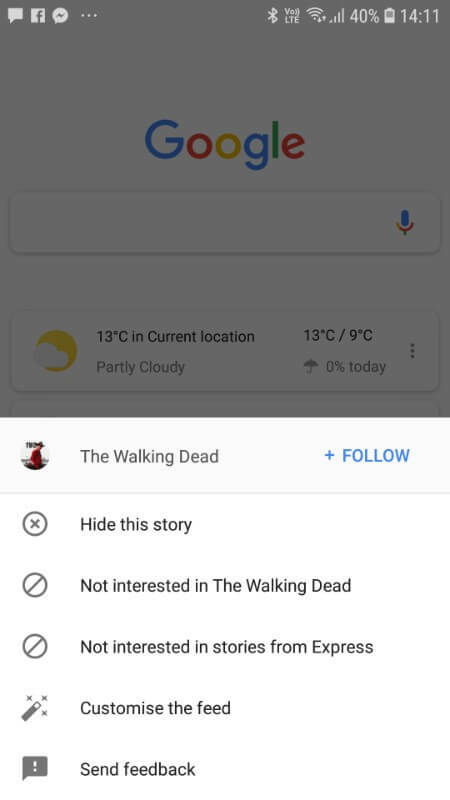 You can help Google to fine tune its recommendations for you by clicking on the three dots to the top right of each panel and select whether you want to follow the topic, not see content about that topic or from a particular source, or whether you want to customise the feed. The ‘Customise the feed’ option relates to the Discover feed in its entirety rather than a specific topic. You can add more topics to follow, manage the settings for your interests, view the local weather, get bill reminders, recipe suggestions based on your likes, and more. 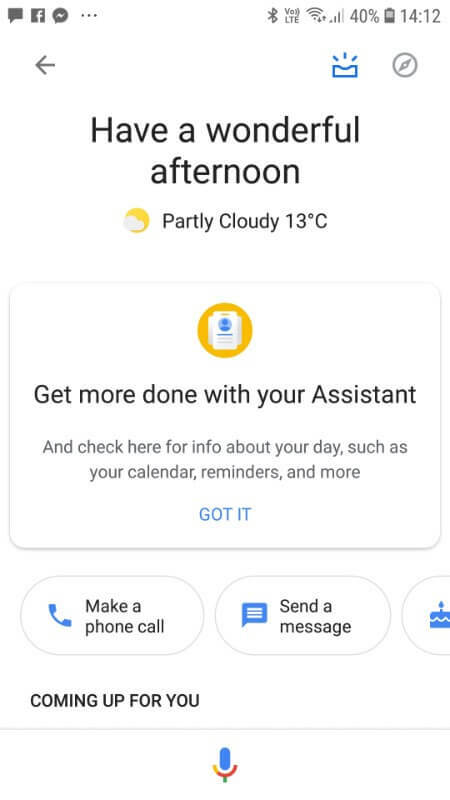 The ‘Updates’ tab next to ‘Discover’ is a feature in Google designed to help you get more out of your Google Assistant. From this tab, you can find out whether there will be traffic problems on your daily commute, make a phone call, check the weather, set an alarm, play music, view your calendar, find local restaurants, search the dictionary, track your stocks and shares, or find a location on Google Maps. Click on the ‘Search’ tab and you can see your most recent Google searches at a glance. If you want to go back to the results for a particular search, just tap it and Google will restore them. The ‘Recent’ tab will give you a timeline of the searches you’ve made and the websites you have visited recently, as well as indicating how many pages you viewed on each site during your visit. Simply swipe left or right to navigate through this feed. 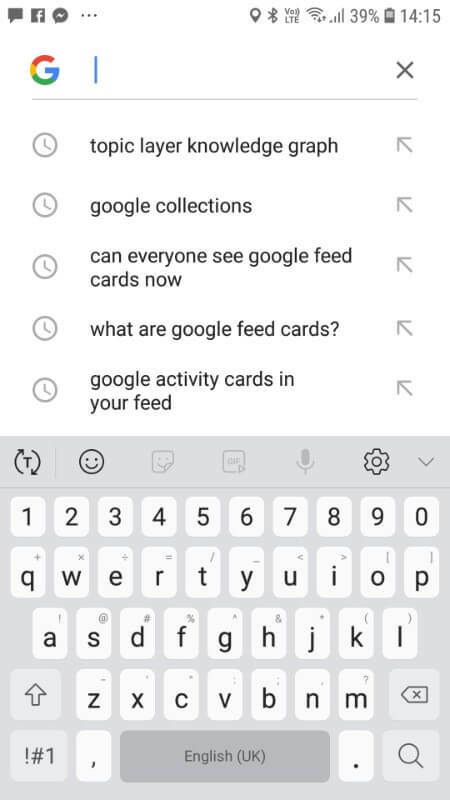 The ‘More’ tab takes you to a different view of your Google account where you can view your recent searches, Collections, personal search (including the contacts you’ve spoken to), text conversations from your phone, Google calendar, shared images, your most recent opened apps and most recently visited websites. You can also set reminders, customise your ‘Discover’ tab and change the Google search widget. Having mentioned ‘Collections’ under the ‘More’ tab, Ben Gomes also highlights them as part of the ‘Journey not answer’ shift that Google search is making. Collections are a means of collecting useful content around single topics in one place so that searchers can better track and organise web pages they like. Google says Discover will only appear when the search engine feels it would be useful. You are able to remove searches, pause the feed card or hide it. However, its presence reflects Google’s commitment to providing a more dynamic, intuitive search experience where you can access information you didn’t even know you needed yet. A new ‘topic layer’ in Knowledge Graph will aid this further. The topic layer’s algorithms are designed to learn how interests develop. They will analyse every topic and create hundreds of sub-topics, as well as an understanding of how sub-topics connect and relate to one another. What does Google Discover mean for search and how can you improve your SEO strategy? Looking at Ben Gomes’ article and the focus on providing searchers with genuinely relevant, helpful content, I think the priority of every successful SEO strategy must be creating and publishing original, fresh, high-quality and relevant articles, videos and images. We should also consider the impact that voice searches and artificial intelligence (AI) are having on search as people are using entire phrases and questions to find information. Voice searches, in particular, are central to the mobile search experience. To improve your SEO strategy further, I also think we need to plot out the searcher’s journey and pre-empt the information people might want so that we can provide as many layers of content as possible. ✔️Regularly publish original, high-quality content targeted at a specific audience. ✔️Organise your content by topic clusters. ✔️Think about what information people will want at different stages in the customer journey. ✔️Optimise with voice searches and AI in mind. How is it possible for a search to be query-less? The Google team wants the search engine to take on a role akin to a librarian who looks at your reading preferences and is able to say, “As you enjoyed reading this, I think you might love this content” or “Now you know about this, I think you will find sources X, Y or Z fantastic for deepening your knowledge”. We will increasingly find through Google Discover that, when we log on to the search engine, we’re presented with multiple links to content that is likely to extend our interests or build on our current preoccupations. We may not even have to make a search at all to find what we need. Ben Gomes says that Google Discover aims to stay one step ahead of the searcher, bringing you things you haven’t started searching for yet as the next logical step in the journey. In this era of ‘fake news’, Google has stated a commitment to bringing searchers multiple perspectives on the same news stories to give people the most balanced views of what’s happening in the world. Content will also be available in multiple languages on one feed, rolling out in English and Spanish in the US first, which will appeal to multi-lingual users. Google says it will return a mix of fresh and evergreen content (i.e. older content that hasn’t gone out of date) in Google Discover and search results. Evergreen content has a great deal of value. For example, if you are learning to play the piano and search for online tutorials for your experience level, Google may decide to prioritise a tutorial that has been available and well received for years because it’s the most relevant to your needs. ✔️Conduct a content audit to identify any content that is now out-of-date or where there are gaps in the information you provide. ✔️Update any articles that need refreshing. ✔️Promote your evergreen content as part of your marketing by sharing it on social media and in your e-newsletter. ✔️Make sure you cite your sources for factual information. Search results started life as plain text back in 1998 and focused very much on text-based web pages. According to Google that all changed on 24th February 2000 when Jennifer Lopez wore that green dress to the Grammy Awards and sent people into a frenzy searching for pictures online. At that point, it became clear that people wanted the means to search for images too. It quickly became a priority to add pictures to search results. Since then, pictures and videos have become more and more important to the search experience. They have also changed how people access information online, transcending language and grabbing attention more easily than lines of text. For this reason, Google Discover is visual in nature, using large images to draw people in and flag up what the content is about. It also includes illustrated weather reports, live sports clips, pictures of meals for recipe pages, and much more. In the past, the challenge for Google has been correctly understanding and interpreting images. Alt tags are one way of adding a text description but they’ve been abused, ignored and stuffed full of keywords more often than not. Google now has the technology to extract concepts from images, analysing how pixels come together without needing words to describe the finished visual. Artificial intelligence can also infer meaning from the context surrounding an image. Videos will also show up more frequently in search results. 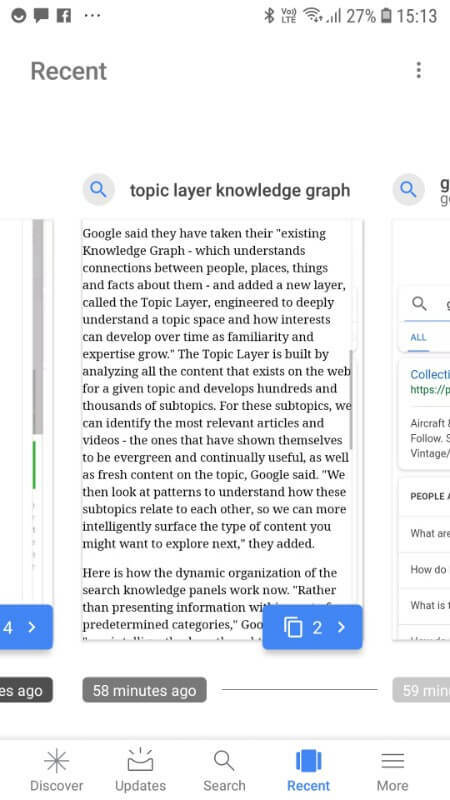 Google will use the topic layer in Knowledge Graph (mentioned above) to understand the content of a video and make sure that you are shown the most relevant footage. In February 2018, Google announced that it was trialing AMP Stories, “a visual storytelling format for the open web”. AMP Stories enable publishers to tell a news story or run a campaign that combines visual elements such as videos, images and animations with text and tappable interactions. The aim is to give people a more ‘visual entry point’ to content that has traditionally been communicated with just text. You can read more about AMP Stories, including how to build your own, at the AMP Project. As AMP Stories are still at the experimental stage, you can preview them via a mobile browser at g.co/ampstories. Google hopes to roll them out in search and via Discover at a later date. In an article published in September 2018 – Making visual content more useful in Search – Google Images’ Director of Engineering, Cathy Edwards, says that the last 12 months has seen a massive overhaul of Google Images’ algorithms. One notable takeaway is that the authority of a web page on which an image appears is a more important ranking signal than ever before. Google wants to return high quality, relevant images that come from web pages with high quality, relevant content. Edwards also says that Google Images’ algorithms are more likely to prioritise images that are placed centrally nearer the top of a web page. One example given in this article is that if you were to search for a specific pair of shoes, the Google Images search results would be more likely to return an individual product page of the shoes over a category page featuring lots of shoes, including the ones in your search. This is because Google assumes that if you’re searching for a specific pair of shoes, it’s probably because you want to buy them. The aim is to make it as easy as possible for us to achieve our search objectives using images. You may also have noticed a different look to Google Images since September 2018. Make a search now and you’ll see that there is a choice of search terms along the top of the screen which you can click on to refine your search. As you can see from the screenshot above, I ran a search for ‘Golden labrador’ and Google Images suggested related searches such as ‘puppy’ or ‘Golden Retriever’. If I click on the ‘puppy’ suggestion, the images all change to those of golden Labrador puppies rather than puppies in general. Google is now captioning every image with the title of the web page it came from so that you can understand the context of the image and go to the source page for more information. You may also be presented with a list of similar popular search terms somewhere within the image search results page. Google Lens is another tool that’s designed to make search more visual. You can find the Google Lens tool in the Google Assistant on your phone, in Google Photos for Android and iOS or by downloading the Google Lens app from the Google Play store. The idea with Google Lens is that you can search what you see. Just click on the Google Lens icon (see image below, which is taken from my Google Assistant screen) and point your camera at what you want to search. You can search the name of a dish on a restaurant menu, a dog running around in the park, an item of clothing you like, a local landmark, a plant in the garden, the cover of a book, and much, much more. This third shift in Google’s approach makes clear that on-page SEO needs to incorporate clearly thought out, high-quality visual elements that complement the written content of a web page. ✔️Consider enlisting a photographer to take some photographs that are unique to your business and website. ✔️Audit the images on your site and review whether they accurately reflect the content of the page they’re on. Could you use a more relevant picture? ✔️Look at the design of each web page and where the images are positioned. Think about moving the most relevant, high-quality images to a more prominent position above the fold of the page. ✔️Explore how you can incorporate videos, images and other visual elements into your web pages to work with the text to convey the key topic of each page. What’s clear is that Artificial Intelligence is shaping the search experience and, by extension, SEO. It’s a topic I’ve covered here on my blog. Whether AI is helping Google to predict our next searches, understand images or deepen our knowledge, it is underpinning the future of search. But while the innovations and technology may change, I think it’s important to return to the beginning (in this case, 1998) and Google’s mission to organise the world’s information and make it accessible to everyone. This should be at the core of any future-proof SEO strategy. To improve our SEO we must, therefore, think about our audience and try to organise our online information in a way that makes it accessible and useful to them. 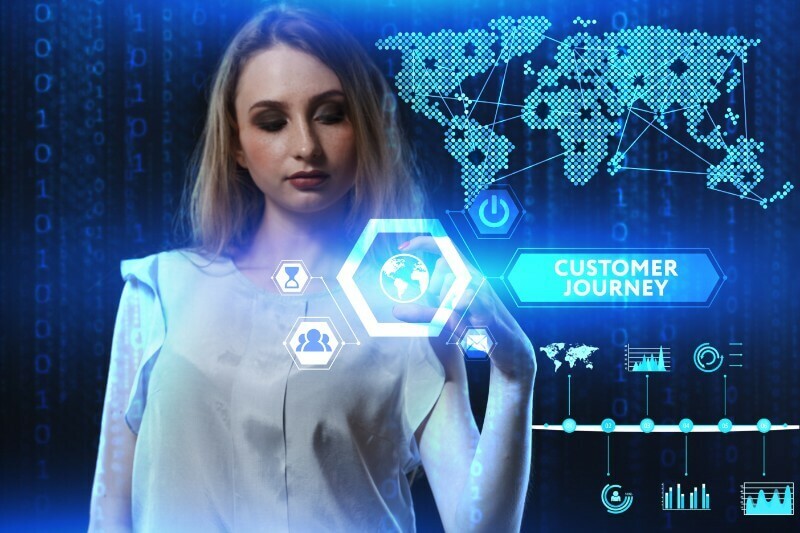 If we can pre-empt a customer’s journey or provide deeper levels of unique, high-quality information built on our expertise, then we’ll stay a step ahead in the SEO journey. We’ve been helping our clients stay a step ahead in the SEO journey for a long time. Would you like to know how we can help you do the same? Schedule a call with Hazel by clicking the link below and let’s chat. My goodness, what an interesting post. Artificial intelligence, speech recognition, and image classification software for integrating ‘machine learning’ into search engine algorithms. Artificial intelligence such as speech recognition and image classification software. 40% of adults now use voice searches at least once a day and, by 2020, 50% of all searches will be voice searches!! This is changing the face of SEO. Google Lens is another tool that’s designed to make search more visual. You can find the Google Lens tool in the Google Assistant on your phone, in Google Photos for Android and iOS or by downloading the Google Lens app from the Google Play store. All great things to check out. So helpful thanks for taking time to lay this out for us! I learned about new tools in this post thank you. I also learned about SEO changes.